Doing our best to hide from the June New Orleans heat in the cool confines of Sucre, Sam and I were enjoying a few macaroons and discussing the all-important topic of dinner. Stomachs still heavy with the recent memory of beignets, snowballs, and po-boys, a butter-laden dinner at one of the grand dames was quickly dismissed. Hoping to show Sam there was more to New Orleans than Bourbon Street and the insulting offerings of the Hard Rock Café, I proposed a trip to the West Bank for a little Vietnamese. As you might expect there was an ulterior motive to this suggestion. Despite my family’s propensity to seek out any and all Asian cuisines in a city, New Orleans has proved to be the exception to that rule, especially when it comes to Vietnamese cuisine. With my mother not liking the food and my father being largely indifferent, my sister and me were the sole occupants of the pro-pho camp. Sadly, on the rare occasion that my sister does make it to New Orleans, her mind is set on the usual fare, crawfish, gumbo, beignets, etc. The result is that I’ve never so much as touched a bottle of fish sauce while in New Orleans. Thankfully, change was ever present as Sam agreed to the cuisine; the only problem was figuring which restaurant to choose. Knowing that in times of confusion it is wise to defer to those with experience, I turned to the good people at Blackened Out. In the years that I have been following their advice for New Orleans, Peter and Rene have rarely steered me wrong. So after reading their glowing review of 9 Roses, complete with an eagle rating, Sam and I finished our coffees and began to make our way to the West Bank. Once inside 9 Roses, it was time to sort through the menu and that’s more a challenge than it seems. As other local bloggers have pointed out (here and here), the menu at 9 Roses is vast. There are easily more than 100 items to choose from and each section is a minefield even with the aid of the helpful descriptions. 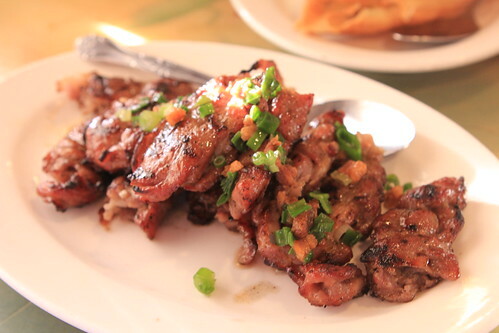 Loosely following the lead of Blackened Out, things began with an order of chargrilled pork or THỊT NƯỚNG. Even when overcooked, pork has a way of being quite tasty, thankfully there was no such dryness with the pork at 9 roses. Large enough to be brilliantly chargrilled on the outside and juicy on the inside, this pork was tender, quite sweet, and the only dish to completely cleaned by the meal’s end. 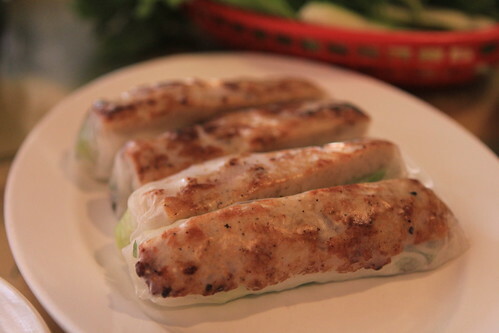 Best eaten with company, I was looking forward to the rice flour crunch of the BÁNH XÈO. 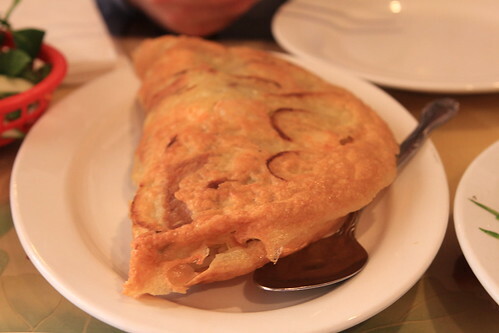 Very large and very thick, this Vietnamese crepe had a shell-like texture that was oily to the touch. Inside the rice flour and egg shell, the usual suspects of shrimp, pork, onion, and bean sprouts were plentiful, but every bite of this crepe was dominated by greasiness. I’m still a little cloudy on how this next dish was ordered, but it appeared to be spring rolls or GỎI CUỐNmade with grilled shrimp. These spring rolls were a bit of a mixed bag. While the wrappers were dry, the shrimp inside were large with a slightly spongy texture. On the whole, the fillings packed a punch of herby flavor and when generously dipped into a bowl of nuoc leo, everything came out just fine. 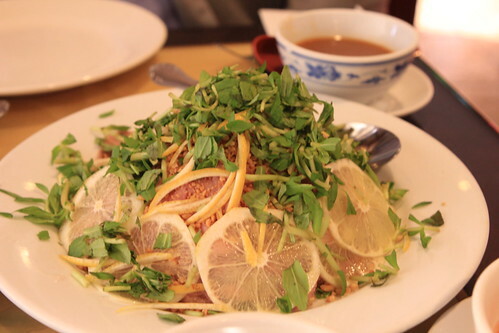 If there was one star of the show, it was far and away the beef salad or BÒ TÁI CHANH. Yes, beneath that mountain of mint, onion, and lemon was a small fortune of rare, razor thin beef tenderloin. Normally, I do my best to avoid tenderloin, but in the raw/extremely rare form I’ll make a ready exception. This dish helped reinforce that standard. With a quick flick of my chopsticks, I was bombarded with the potent but succinctly compatible flavors of cilantro, onion, and lemon with the silky flavor of the tenderloin providing an ethereal meaty foundation. 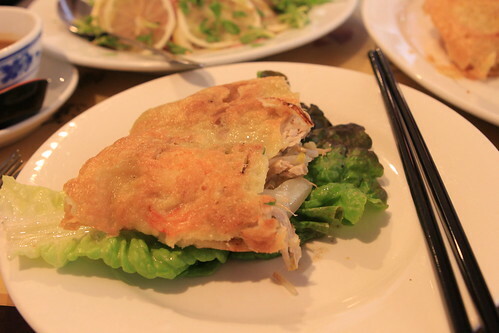 Nearing the end of the meal, an order of the house special roasted quail CÚT QUAY BÁNH BAO appeared. 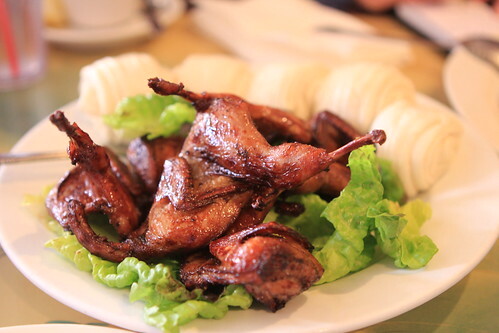 With a deeply lacquered skin, I was surprised at just how similar these quail were to char sui in both color and flavor. 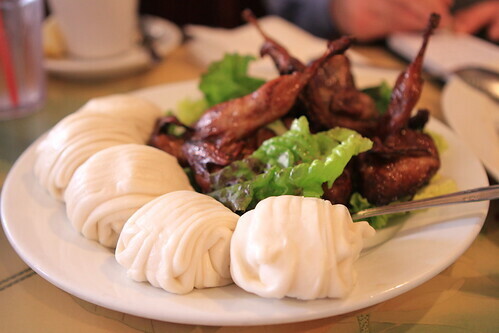 Largely unsure how to properly apply the bao, we figured they were best left alone and focused our efforts on the quail. Thankfully, the quail had plenty to offer with a deep flavor that made picking through the tiny bones well worth it. With Sam begging for mercy, I couldn’t help but see how 9 Roses handled the litmus test of PHỞ ĐẶC BIỆT. From the start this pho broth was heavy on the onion and cilantro but had an unctuous and well-rounded overall flavor. 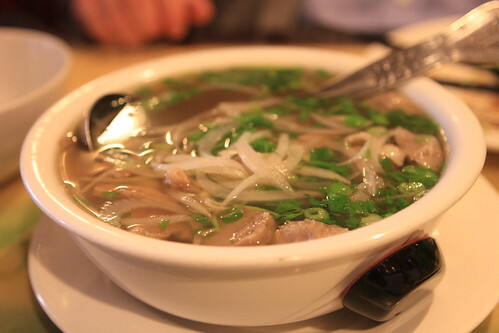 It was with the beef that the problems with this pho began to appear. Thickly sliced, I was surprised to see the fat cap on the brisket was left intact. While there was a pleasant beefiness to the brisket, it and the other cuts of beef were both well overcooked and quite dry. I realize that many cuts of pho meat are cooked well done, but there’s a difference between well done and bone dry. The tendon also suffered as the pieces were far from soft and made any attempt to chew them a burden on the jaw. It’s rare that you find a dish where it can be described as both undercooked and overcooked but this pho required both adjectives. It’s a shame that such good broth had to go to waste. After six dishes, it was painfully obvious that I need to spend more time working my way through the menu at 9 Roses. While I was delighted by the well executed simplicity of dishes like the beef salad and chargrilled pork, it was the moments of mediocrity, the pho topping and the banh xeo, that left me a little hesitant about 9 Roses. However, this was my first foray into the world of New Orleans Vietnamese cuisine and I now have a benchmark. With many restaurants in my future, it will be interesting to see how they compare to that first meal at 9 Roses.